TEXARKANA, Texas – Women for A&M-Texarkana, a dynamic group of over 300 women working to enhance economic development, cultural enrichment, and generate money for scholarships and degree programs at Texas A&M University- Texarkana, recently donated $97,500 to two scholarship funds at the university. 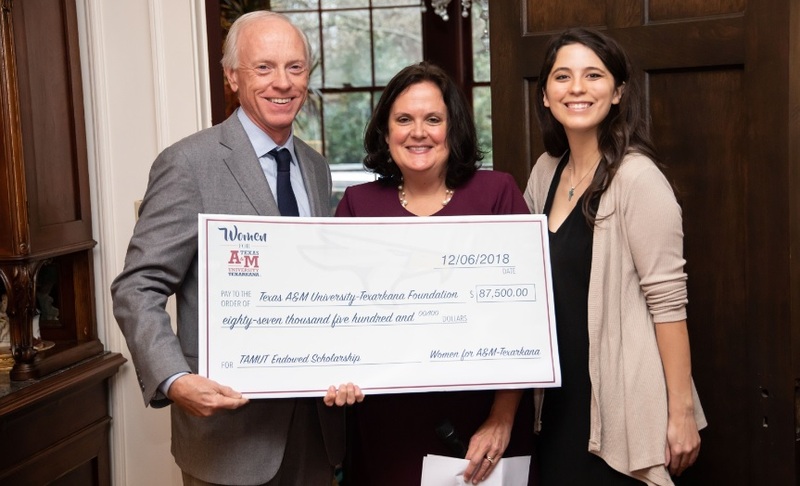 The group held its annual Holiday Lunch Social on December 6 and presented a check for $87,500 to the A&M-Texarkana Foundation Endowed Scholarship, and $10,000 for the Women for A&M-Texarkana Annual Scholarship. The donation to the Foundation Endowed Scholarship will be matched as a part of the Foundation Board’s current Double Your Impact Campaign, where board members pledged to match donations to the fund on a dollar for dollar basis up to a total of one million dollars. This campaign stretches the $87,500 donation into $175,000 for the endowed scholarship fund. The $10,000 donation will support annual scholarships for 9 Texas A&M University-Texarkana Students. The mission of Women for A&M-Texarkana is to support and promote the many ways Texas A&M University- Texarkana enhances life in Northeast Texas and Southwest Arkansas. Women for A&M-Texarkana was founded in 2005, and to date has raised over one million dollars for scholarships and university programs at TAMUT.